Lane Murdock to be Honored at Ridgefield’s Martin Luther King, Jr. Day Ceremony Tomorrow! On Monday, January 21st, The Town of Ridgefield will present the 23rd Annual Martin Luther King, Jr. Day Celebration, honoring the legacy of the great civil rights leader with an awards ceremony, speakers and performances. 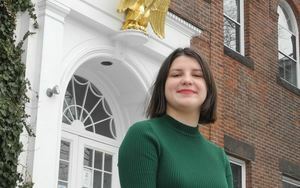 The MLK Profile in Courage Award -- a new award -- will be presented for the very first time at the ceremony to Ridgefield High School student Lane Murdock, who helped launch a national movement. This past year, following the school shooting in Parkland, Florida on Feb. 14, Murdock, then only 15 years old, started a petition to the U.S. Senate and launched a nationwide school walkout. The date she chose for the march was Friday, April 20 -- the 19th anniversary of the shooting at Columbine High School in Colorado. For Lane, it was important that students have a voice and not feel helpless in the wake of such a horrible catastrophe…..again. "If you can't vote, you don't have a lot of concrete power," Lane said in an interview with CNN. "As a student, what do you have? What you have is your attendance in school, and there's power to that. Hey, if we can disrupt the national schedule of kids going to school and draw attention to this issue," she said, "then that's a step closer to change." The 23rd Annual Martin Luther King, Jr. Day Celebration will take place on Monday, January 21 at 3pm at The Ridgefield Playhouse (80 East Ridge). More than 150 member chapters of National School Walkout were formed around the country and her Twitter @schoolwalkoutUS gained more than 130,000 followers. The twitter account now encourages people to vote and to have their voices be heard about important issues, including Gun Violence. Because of Lane’s actions, Gizmodo actually declared Ridgefield High School "ground zero for a national youth movement combating school gun violence." Lane said that she hopes to one day be a journalist. For more information about the Martin Luther King, Jr. event, please call the box office at 203-438-5795, or visit ridgefieldplayhouse.org. The Ridgefield Playhouse is a non-profit performing arts center located at 80 East Ridge, parallel to Main Street, Ridgefield, CT.